As Edgetch, we have developed value-add banking products. If you are interested in any of our product, please contact us and we will be glad to supply more information. ,Salary processing, MICR cheque readers integration, Credit card management system (full integation with WAY4 CCMS) just a mention some. T24 User training, We offer both Technical and business training for T24. We have conducted training for some of our bank clients. One notable is the T24 business traning done at Faulu Kenya for about 19 T24 modules targeting more 800 trainees. KCB Bank - An ISO8583 online realtime interface to T24 at KCB Bank and supports all the five subsidiaries. The interface also supports push alerts to customers mobile phones. Integration to University, We integrated to National University of Science and Technolgy Zimbabwe to T24 for school fees payment for Metbank. 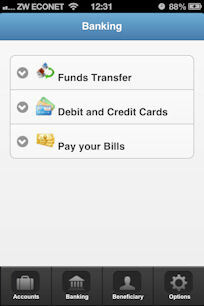 The integration is online realtime and allows T24 to insert payments into NUST using T24 teller screens.